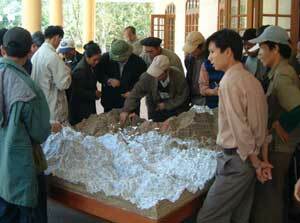 This 1:10,000 scale (vertical 1:6,300) 3D model of Ba Be National Park was completed in December 2003 in Bac Kan Province, Ba Be district, Vietnam. The model, representing an area of 400 km2, was built to determine land use and enclave delineations within Ba Be National Park and its immediate Buffer Zone. 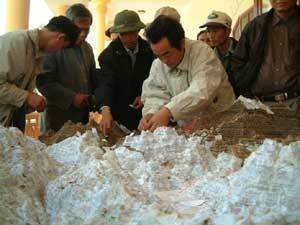 The model was produced by local stakeholders in the framework of the PARC Project. PARC was co-financed by the Global Environmental Facility (GEF) and the United Nations Development Programme (UNDP) and implemented by the Forest Protection Department (FPD) of the Ministry of Agriculture and Rural Development and the United Nations Office for Project Services (UNOPS). IUCN – The World Conservation Union provided technical assistance at the national level and Scott Wilson Asia – Pacific Ltd. provides technical assistance at the site level. Depicted data reflect the cognitive maps of 44 village elders and village heads from six communes and commune members, Ba Be National Park officials, Forest Protection Department of Ba Be National Park, PARC Project staff. Ba Be National Park was established in 1992. The national park area and its boundary were defined, marked, and mapped prior to the 3D Modelling exercise. However, local communities needed to understand and acknowledge the state and function of protected area boundaries with respect to their agricultural lands. Therefore, building a 3D Model was thought to be the best method to disseminate and share information with local people regarding the location of boundaries and therefore the status of lands within the protected area and its adjacent agricultural and forestry lands. 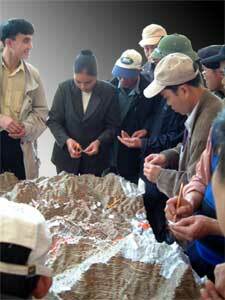 Once the 3D Model exercise was completed local community stakeholders participated in the synthesis of information and then its definition within the model landscape. Through the exercise, local communities have become more aware of the location of national park boundaries, and national park officials have acknowledged the location of agricultural and forestry lands adjacent to the protected area.